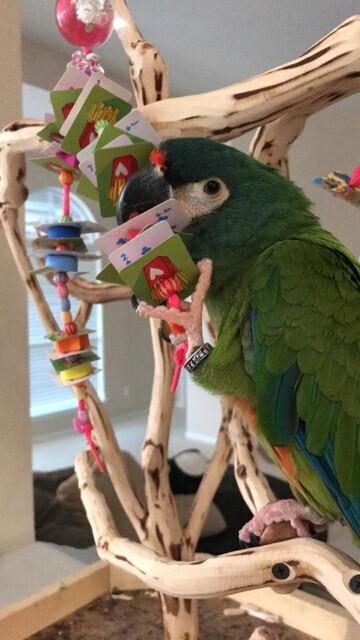 The Busy Beads was designed for the parrots that don't want to work so hard to snap beads, chew cards and shred some foam pieces. The beads and materials included in this project are: a brightly colored, neon shoelace ... knotted on top to make a loop for easy hanging. Then we added a petal bead, followed by a grape bead and ending with another petal bead. We used a clear, transparent petal bead but it is also available in different colors. A fun, versatile, sturdy bead that adds beak teasing interest. Each leg of Busy Beads craft barrel beads, separated by playing cards and chunky foam shapes. All knots are hidden by the pumpkin beads so there's no snip and drop with this toy. We finish off the toy by adding our signature Busy Beaks "Bs" at the end! Lots of texture to tease the tongues of your feathered family. 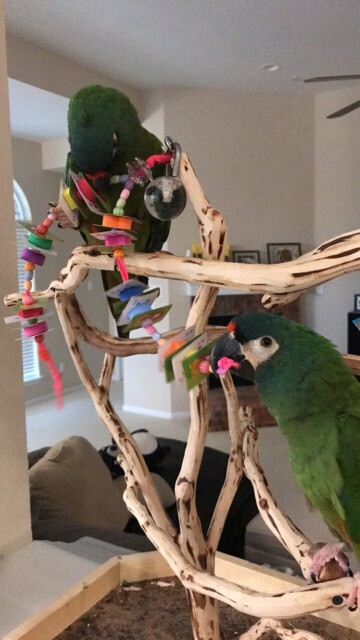 Illiger Macaws (Mac & Larry) are beadaholics!! They do like their beads in various forms and shapes!! What fun!! 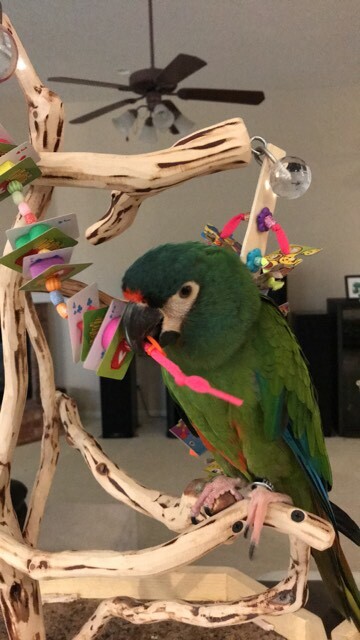 Mac is enjoying his Busy Beads ... and you can see his pre-loved Puzzle Cascade background!